Last night I attended a district sponsored meeting about Common Core. They announced it in advance to the high school parents and planned it for the hour before the Open House began, thus ensuring that the meeting had a limited time frame. Parents were treated to about 40 minutes of a lovely fable about where Common Core standards came from and what they would do for our children. It went something like this. Somewhere in a distant land not too far or too different from here, a group of teachers (like us) and parents (like you) and researchers (who are undefined but obviously brilliant) sat around a table and thought about what we should be teaching our children. It is a good thing they did this too, because this had never been done before. To reinforce that point they showed a short video about two peole getting stuck on a stalled escalator who could not think of an alternative way to get to the top of the stairs. This was meant to show what education had formerly done. It taught students one set of facts. When presented with a different problem, they were incapable of applying their knowledge to find a solution. We parents could all laugh at the characters on the stairs and recognize them as the requisit simpletons in many folktales. In doing so, we were expected to accept the premise of education before common core. This description of students obviously does not explain how we got to the moon, a place we had never been before under conditions that were in many ways theoretical. It does not explain the invention of the cell phone, or this child's invention of a new test for pancreatic cancer at age 15 but, hey, this was a fable. Then we were introduced to a new character, the Modern Learner. The Modern Learner can solve "real world problems." Again, an example was shown of a very young child who needed to recharge a vacuum. Not knowing where the vacuum's charge cord was, she stuck a cell phone charger into the motor vents of the vacuum. This is how the Modern Learner works. They use accumulated bits of knowledge to form new solutions. In Common Core the Modern Learner does not have to have the right solution to the problem, just a creative one. Did the child safety industry psychically predict the existence of the Modern Learner when they developed all those devices decades ago to protect children from their experimentations with their limited knowledge that things can go in an outlet and toilet seats can go up to reveal a great water filled play area where things can magically disappear if you push the shiny handle? The Modern Learner is not at all like their predecessor who I think must have been paleolithic learner. An older learner, when asked how they tell time, would have drawn a clock. The Modern Learner would draw a cell phone (a real example from the story.) In this fable, our long education history has not produced children able to figure out how the lesson on division in class could be used to divide up the bag of candy they bought amongst their friends. Students have never had to supply documentation to support a research paper. And they certainly haven't ever had to work with other children on like, say, a team to achieve a shared goal. 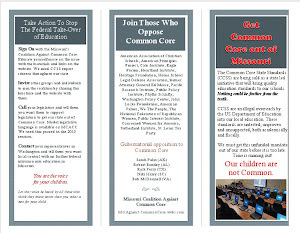 Thank goodness that team of kindly people got together to give us common core. The story was filled with magic and things that are not what they clearly appear to be. The standards are just standards. 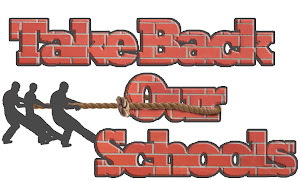 The district will maintain complete control of the curriculum. We will not be teaching to the test. The magical 4 C's (Communication, Collaboration, Critical Thinking and Creativity) are all your child is going to need to succeed. The standards are just guidelines except where they dictate how we will score children in our new standards based grading system. Then they pretty much change the way our teachers do their jobs. We will teach "academic vocabulary" which was later explained to mean teaching students how to read a test question and know how to answer it. Now we magically are not teaching to the test. We are using our focus on the test structure and parameters to guide our curriculum so, don't worry we are still in control here, not the test developers. The district personnel talked about scary monsters like informational text and standardized testing. Without mentioning that the requirement in common core is for 70% of high school literature to be informational text, they showed that they can slay that monster by having children read their science and math books. See? Not so scary now. And standardized testing is no big thing. The discussion leader listed off the numerous EOC's and other standardized tests our children are required to take. 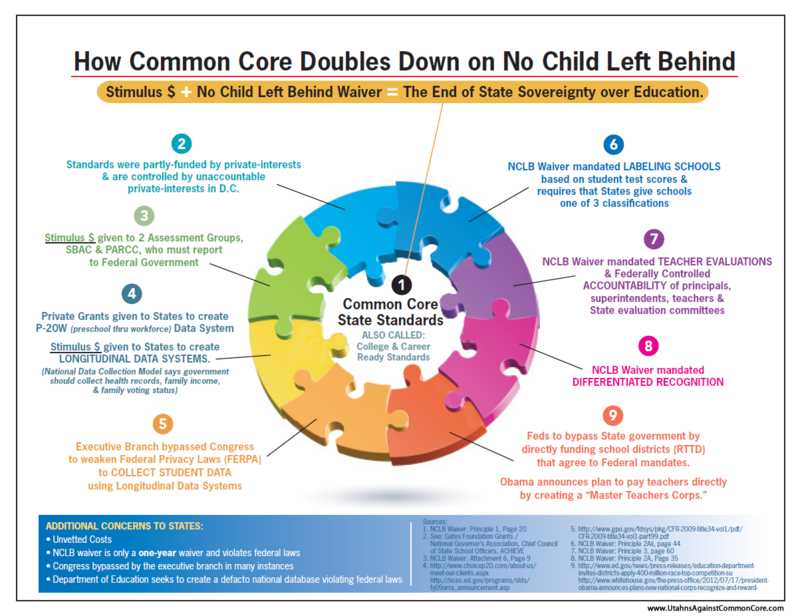 The SBAC test for Common Core would be just one more. They didn't mention a word about the tests being computerized and requiring 8-10 hours to complete so I think that monster may still be a little scary. I give the district staff credit for keeping it together during all of story hour (and question time.) They were only expecting 5-6 people, not the 60 who showed up. They expected some of the questions, but not all of those asked by the fairly well informed crowd. There were many there who knew that the fictional assembly of kind hearted souls who developed common core was just that, a fiction created to passify the public. They saw that the standards really weren't an improvement for education in our district. They asked good questions like, "With all this standardized testing, do you even have time to teach any more?" But alas, story time ran up against a hard break and had to end without knowing what happens to the Modern Learner. Will he or she get to college? Will our children succeed? Stay tuned. Brilliant. And forgive me for being obtuse, but are you serious about the cell-phone charger in the vacuum example? I hope this is the kind of informational text our kids will get to try with their critical thinking--after Common Core ed, of course, since no one has ever thought critically before. Autumn, yes that really was in the presentation. She even had a picture of it.